Guitarist/composer Mike Baggetta continues to create music that, while veering from what one might call the “mainstream”, nevertheless is quite accessible and attractive. He does so by creating musical adventures that lead the musicians (and hence the listeners) down unexpected paths. He undertakes his latest journey, "Thieves and Secrets" (Fresh Sound/New Talent), in the company of Jason Rigby (tenor and soprano saxophones), Eivind Opsvik (bass) and the indefatigable George Schuller (drums). Opening with a group composition “Transmissions”, this is a piece where the music often shifts rhythms and intensity levels at the drop of Mr. Schuller’s ubiquitous pork-pie hat. The interactions of the quartet during the solos is commendable as everyone is involved Rigby’s saxophone weaves line around the guitar while the rhythm section alternately pushes and pulses, the bass lines moserving as the foundation while the drummer creates rhythmical counterpoint. The guitarist keeps finding new ways to express himself. “New Scotia” is a work for acoustic and electric guitar, a plaintive melody for one and sonic textures for the other. Rigby's tenor and Baggetta's acoustic guitar are the solo voice on "Hidden Things", the expansive melody suggested in the guitar opening and carried out by the reed. The short yet expressive guitar solo builds upon the handsome saxophone melody. Baggetta’s loops set the stage for the handsome ballad “The Wind”, the drums laying down a solid 4/4 for a melody that could have been a hit for WILCO or a group with an Americana sound. Schuller's insistent drive motors "World Leaders", a piece where the electric guitar mixes with soprano saxophone on the main theme. Baggetta pulls out the stops (at least, an octave divider) for his furious but never out-of-control solo. The final track, "Bridges", blends the fire one hears in a Neil Young/Crazy Horse piece with the jazz chops of Nels Cline Singers jam. "Thieves and Secrets" draws you in with its energy and keeps one's interest with its sonic experiments plus the impressive melodic variations. Go see Mike Baggetta in person as he always gives is 110% to his music as the listener can tell from this excellent new release. For more information, go to www.mikebaggetta.com. 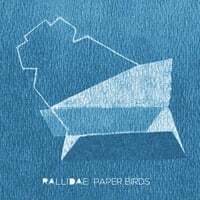 How best to describe the music of the trio known as Rallidae? First, know that the ensemble includes Angela Morris (tenor saxophone, voice), Scott Colberg (acoustic bass, voice) and Alex Samaras (voice). Understand that Ms. Morris has studied with Darcy James Argue and is currently a member of the BMI Jazz Composers Workshop under the tutelage of Jim McNeely and Mike Holober. Fellow Canadian Samaras has worked with Meredith Monk and leads the 8-voice GREX ensemble. Bassist Colberg is extremely busy as both a band member of numerous ensembles and as a sideman. None of that will really prepare one for this adventurous project. The trio's debut, "Paper Birds" (self-released by Ms. Morris) hews closer to the music of Theo Bleckmann (especially in Mr. Samaras's wide ranging vocals) and Sam Sadigursky (setting poetry to music). This is a 4-song EP, clocking in at just under 24 minutes. Ms. Morris wrote the music and lyrics save for the Johanna Skibsrud poem on the opening track, "I Had Imagined Them, Unthinkingly", also the only track with 3-part vocal harmony. I like the blend of the clean lines of the female voice with the more pliable voice of Mr. Samaras. The final track, "Long Time", is just voice with Ms. Colberg's expressive bass; it has the feel of an Appalachian ballad, a handsome melody with a plaintive vocal. The longest cut, "Prettier" (9:03), moves away from simple opening (voice, sax and shivering bowed bass) to a more "conventional" ballad and then out from that into "freer" territory. "Smells Like Paint" tells a more humorous approach to a "pickup" situation where the narrator has already drunk 9 beers. The saxophonist and Mr. Samaras get a bit agitated in the middle of the song and end the song on a frantic "blowing in the ear." "Painted Birds" make take a few intense listens to understand the trio's intent but it's worth the effort. The 4-song program is a smart calling card for Rallidae as it makes one want more and keeps you guessing as to where the music can go. For more information, go to angelamorris.wordpress.com. 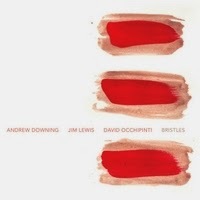 The trio of Andrew Downing (bass), Jim Lewis (trumpet) and David Occhipinti (guitar, effects) have banded together to create "Bristles" (Occdav Music). The recording is both a celebration of great 20th Century painters and a continuation of the tradition in contemporary jazz to reinterpret standards. The 3 musicians, all based in Canada, take an approach to this music not unlike the late drummer Paul Motian used with his trio featuring Joe Lovano and Bill Frisell in that the "melody is king" and everything builds from that. Whereas the tribute tracks are short, often offering only fragments of melody, the majority of the "standards" are longer (yet, at times, just as experimental). Downing's masterfully bowed bass powers his bandmates through an energetic "You and The Night and The Music", a piece that also features a powerful trumpet solo and a rollicking guitar spotlight. Downing sticks to bowed bass for his excellent solo turn. Hypnotic sustained guitar chords and notes set the scene for a slow opening to "My One and Only Love"; halfway through, the bassist falls into a medium-tempo walking line for the trumpet solo. "Once I Loved" opens with the trumpet stating the melody, the guitar sustaining with feedback behind him and the bassist strumming like a flamenco master. The pace of the performance is slow yet always moving forward. There is a gentle sweetness to the performance of Johnny Mandel's "Emily", a feeling that continues all the way through - the melody keeps experimentation to a minimum and it sounds as if the audience (5 of the 6 "standards" were taped in person) appreciated the group's effort. As for those "painters portraits", none exceeds 1:57 with four tracks around 70 seconds. These totally improvised "miniatures" are quite a contrast to the longer works in that the improvisations capture the essence to the particular painters; "Jackson Pollock" has a wildness, a violence to its composition while "Paul Klee" is more deliberate, more angular yet softer overall. "Emily Carr" (a British Columbian painter who excelled at both landscape paintings and First Nations totemic representations) receives a dignified if still experimental performance while the American "Cy Twombly" (1928-2011) gets short phrases and barely formed sounds, a sonic representation of his abstract "scribblings." The pun of "Bristles" as the title of this recording refers as much to the artists who are celebrated as to the way Andrew Downing, James Lewis, and David Occhipinti create their aural landscape (musicians as "sculptors of sound"). Subdued yet intense, this album is one well worth keeping. For more information go to www.davidocchipinti.com/bristlestrio.html.